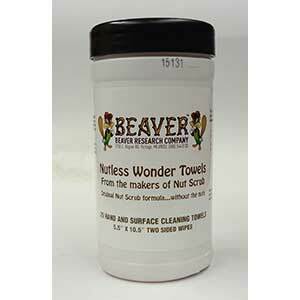 From the makers of Beaver NutScrub Industrial hand cleaner. Pre-moistened towels provide fast, easy and effective waterless hand cleaning. Can be used anywhere to remove paint, printers ink, grease, tar, adhesives, sealants, caulk and most other common soils associated with the industrial environment. Also for use by anyone who gets their hands dirty, grimey and filthy. Pre-moistened towels are excellent for cleaning dirt, grease, and oil from hard nonporous surfaces such as tools, engine parts and countertops. Pre-moistened towels are powerful and safe leaving hands clean, dry and soft.